Colleges must decide who supplies mobile technology in the classroom. According to CDW•G’s Learn Now, Lecture Later report, notebooks and netbooks are the prevailing classroom technology, with nearly three-quarters of student and faculty groups reportedly using the devices. Fifty percent of students and 36 percent of faculty also use smartphones; 26 percent of students and 34 percent of faculty use tablet devices; and 19 and 17 percent of students and faculty, respectively, use e-readers. While some faculty may fear that personal devices in the classroom will distract students, many recognize the potential of technology-rich environments to support active learning. With access to a personal device and the Internet, students not only can consume content, but also produce it during class time. 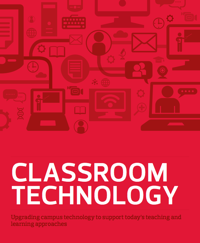 Download our free classroom technology reference guide here. E-textbooks and an LMS enable students to quickly review key subject matter, recall and replay the instructor’s latest lecture, or submit an assignment before the end of class. Research and collaboration also can be done in real time. With audio and video capabilities built into many personal devices, students can generate multimedia content to demonstrate mastery of a subject and assist others in developing the same. Schools are faced with myriad options when evaluating hardware, and also must decide whether to permanently equip classrooms; deliver devices via a mobile lab, one-to-one or loaner program; or simply allow any and all devices through a BYOD initiative. Each approach has its pros and cons. Institutions that provide devices (either through fixed or mobile labs or one-to-one programs) control the hardware and software, ensuring that all students are on a level playing field with access to the same tools. However, these devices must be maintained and refreshed, at a cost. A BYOD strategy can mitigate the time and expense of hardware maintenance, but students will use a variety of devices, platforms and software tools (and some students will have no device at all). What follows are the current options available for personal computing, however it is approached. Once the workhorse of institutional hardware, desktops today are found primarily in instructional or open-access computing labs, as well as on instructor podiums. Deploying desktops is a good way to ensure hardware and software consistency, and they often are the most robust choice, with excellent memory and processing power. Their size and cost, regular imaging requirements and three- to five-year lifecycle make them less desirable to some. Virtual desktops and thin clients are a good choice for universities that want to provide a desktop computing environment in the lab without imaging. A desktop can be delivered to an end user, but the actual applications, operating systems (OSs) and computing are located on a server and delivered over a network, which requires a robust network, server and storage infrastructure. The underlying virtual desktop infrastructure (VDI) adds value to a BYOD initiative, letting students access a consistent desktop and institutional software from their own notebooks, tablets or smartphones. The notebook and netbook’s small size, weight and portability make it the most requested instructional tool by faculty and the second most requested by students, according to CDW•G’s Learn Now, Lecture Later report. Notebooks can provide almost the same computing power as desktops, and lend themselves well to flexible learning environments, but they are resource-intensive. Readily available power — both in classrooms and at charging stations — is essential. Netbooks bridge the size and capability gap between notebooks and tablets. While netbooks can run software locally and perform basic office functions, they are best deployed where Internet access is the primary need. A newer breed of netbooks running Google’s Chrome operating system offer a lower-cost, application-based computer that runs virtually everything off of the Internet. The convenience of tablets has propelled them swiftly into classrooms. Their popularity can be attributed to small size and weight; long battery life; and versatility, with applications for browsing, email, e-textbooks, note taking, photos and video creation, flash cards, educational games and more. Some institutions are experimenting with tablet devices as a replacement for notebooks, but they do have limitations, including lack of an integrated keyboard and reliance on applications. When such devices are delivered as part of a mobile lab, it can be difficult for students to take full advantage of applications requiring user-specific settings because of required institutional settings that lock them down. E-readers are tablet-like devices designed specifically for reading digital books. An early benefit of the devices was their “E Ink” technology, which produces a paper-like image and reduces eyestrain. Some e-readers now feature LCD screens, similar to notebooks and smartphones. The popularity of e-books is rising, but the value of e-readers themselves remains unclear. E-books often are provided in proprietary formats. And while some e-readers are compatible with multiple formats, others require conversion or support only their own format. The rise of tablet devices, with a similar form factor and ability to utilize apps to read different types of e-books, may lessen the appeal of e-readers. While not typically provided by an institution, smartphones bear mentioning because of their increasing use in the classroom. Half of students and more than a third of faculty said they use their smartphones in the classroom as a learning tool, according to CDW•G’s Learn Now, Lecture Later report. Smartphones can be used in web- or application-based student response systems and for research and access to the LMS. To read more about classroom technology, download our free white paper.